Metals Supplier for Power Generation - Aluminum, Carbon, and Stainless Steel Stock | Texas Alloys & Tool Co.
Keep the lights on around town with regular materials deliveries to your power generating facility from Texas Alloy & Tool Co.
With Texas’ energy demand on the rise, the pressure is on coal-fired, natural gas, nuclear and renewable power generators to improve efficiency and reliability while lessening environmental impacts. Texas Alloys & Tool Co. can help energy providers meet and exceed those challenges by providing quality, timely materials delivery services. We are a full-service stainless steel, aluminum and carbon alloy product distributor for in-state energy providers, and our metal product offerings include stainless steel and carbon alloy tube, pipe and fittings, round bar, flat bar, square bar, hex tube, angle, channel, beam, sheet, plate and diamond tread plate. Our team can meet the tightest delivery needs and quality requirements without blowing the budget. 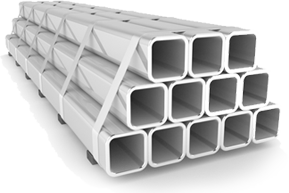 Stainless steel bars and beams are known for increased durability, ease of machinability and superior corrosion resistance. Common grades available include 304/304L and 316/316L stainless steels. Carbon steel is combination of iron and carbon, and it is an extremely useful and versatile steel alloy. The amount of carbon changes the overall structure of the metal and may make it more pliable, stronger, or more brittle. Common grades available include 4140, 4340, A105, A106, A234, 1018, A36, 4140 and A709 carbon steels. We sell hot rolled and cold rolled carbon steel sheets and also offer other finishes for the different carbon shapes and grades we carry. Getting materials that meet your quality standards to your facility on time is our top priority. By managing our own fleet of trucks, Texas Alloys is able to make sure that your industrial stainless steel, carbon alloy and aluminum delivery is there when you need it. Our drivers and material handlers are trained to minimize risks of damage, which is common with motor-freight and third-party trucking companies. We offer weekly delivery routes to much of north, central and west Texas, which enables customers to focus on their work without worry of missed materials shipments. Also, having our own fleet allows for short-notice and off-schedule deliveries. Receive materials at your facility within one week when you order today. We manage our own fleet of trucks. Drivers and material handlers are trained to minimize risks of damage. We offer weekly delivery routes to much of north, central and west Texas. We offer short-notice and off-schedule day deliveries. The metal has no pores or cracks, which reduces dirt, grime and bacteria buildup. Stainless steel is easily cleaned, allowing manufactures can also avoid flavor or order transfer from batch to batch. The metal is corrosion resistant. The amount of carbon changes the overall structure of the metal and may make it more pliable, stronger, or more brittle. The product is cost effective. Carbon steel does not degrade as quickly as other metals.